The cyclist's feet landed on the road but he said if he had been riding any faster, his whole body would have been flung into oncoming traffic. CLEARWATER, Fla. -- Paul Nichols' only mode of transportation is his bike. His ride, Wednesday night, was not a scenic one. "It was a quick, sudden and not exciting trip,” he said. Nichols had left the Sunoco on Gulf to Bay Boulevard near McMullen Booth Road at the base of the Courtney Campbell Causeway when an access cover in the sidewalk collapsed after his front tire passed over it. 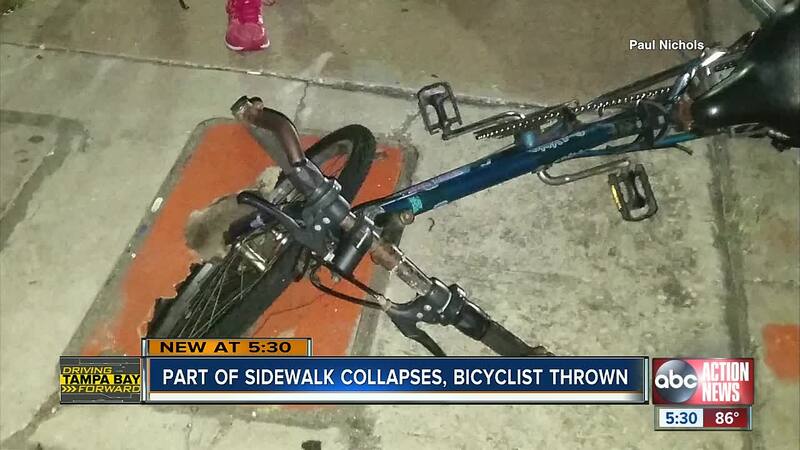 "I didn’t even pedal twice and next thing I know I was thrown,” he said. His feet landed in the road but he feels if he had been riding any faster, his whole body would have been flung into oncoming traffic. "I would’ve been dead," Nichols added. He hurt his arm and suffered road rash plus a gash. "About two inches by about an inch and a half this way,” he said. “I’m gonna have quite the scar." But his bike was fine. Not even a bent rim, which surprised him. He says the depth of the hole was about 10 to 12 inches deep. He says a nearby officer that was directing traffic because of construction came to help. They took pictures and filed a police report. He fears what could have happened if someone had ran or walked over it. “They would’ve definitely snapped or broke their leg," Nichols said. "What if this was an elderly person? What if somebody was in a wheelchair?" The covers are for underground traffic signal wiring owned by FDOT, but Pinellas County does yearly preventative maintenance. Officials say they've never seen this happen before, but are getting it replaced now. Nichols says the sidewalk is extremely busy and believes the county needs to check on the stability of other covers like this one in the area.